Waringstown's Kyle McCallan. 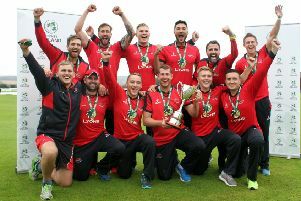 Pic by PressEye Ltd.
Waringstown moved into their fourth consecutive Irish Senior Cup final on Sunday with a 167-run win over Strabane. It marked the perfect finale to a weekend of play which opened on Saturday with Robinson Services Premier League success over Instonians. CIYMS remain in the driving seat for domestic glory but Waringstown can draw confidence from back-to-back wins. Waringstown’s consistency at the highest level is absolutely phenomenal, and they will now have one eye on the final against Merrion on September 1 at Stormont. The pair met in the 2016 final when the Dublin-based side ran out winners by a margin of 51 runs, and Waringstown will be looking for revenge and to defend the title they won 12 months ago. Having been put into bat first, Adam Dennison and James Hall again got them off to a rapid start, racing to their 50 partnership in the sixth over. When Hall was spectacularly caught by Ryan Gallagher on 22, it brought Kyle McCallan to the crease, who has played a wonderful role for the side in recent weeks. With James McCollum on Ireland Wolves duty and now suffering from an injured hand, McCallan’s ability to bat at three has allowed the destructive middle order to remain unchanged. And the former Irish international reminded everyone of his all-round ability by hitting 75 before he was dismissed with the score at 291-5. Shaheen Khan was also at his powerful best, chipping in with 68 from 73 balls - including seven fours - before captain Greg Thompson added 46 from 26 deliveries to get Waringstown to 331-7 from their 50 overs. Overseas professional Khan has had a terrific 2018 campaign, scoring over 600 runs and taking vital wickets, and that was again the case as the pacer bowled Logue in the very first over to put Waringstown immediately on the front-foot. Strabane were losing wickets at regular intervals, and it meant that they were never able to mount much of a challenge on the mammoth total posted by their visitors. James Mitchell has a reputation for getting big wickets, and he chipped in again with two to help reduce Strabane to 73-4. Aaron Gillespie was the only one providing much resistance, and when he was caught by Thompson off the bowling of McCallan for 57 from 54 balls, the game was all but over. The North West side added another 55 after that, but ended their innings on 164-9 with Gaur unable to bat after suffering an injury in the field. McCallan rounded off a superb day by taking 3-39 from his 10 overs, while Khan and James Mitchell both picked up a brace. Waringstown beat Instonians by four wickets at The Lawn on Saturday to keep the Robinson Services Premier League title race with CIYMS alive. Andrew White’s decision to bat first was more than justified when Instonians openers Jordan McClurkin and James Metcalfe came flying out of the traps, hitting boundaries at will and they brought their 50 partnership up in the 9th over. With injuries and unavailability, McClurkin has found himself at the top of the order in the past few weeks, and it seems to bring the best out of him. He hit 109 in no time against Armagh on The Mall, and the freedom with pace on the ball and fielding restrictions in the first 10 overs seems to be conditions he thrives in. James Mitchell was introduced into the attack after the quick start, and he got the breakthrough when Metcalfe skied one to Phil Eaglestone when on 39, and the quick bowler made no mistake in taking the catch. With the score at 66-1 in the 11th over, Irish international James Shannon walked to the crease and was playing with positive intent until he was bowled by Gary Kidd for 10. McClurkin was starting to motor and was showing plenty of attacking intent, taking 15 off a Mitchell over to help bring the team’s 100 up in the 17th over. After such a positive start, Instonians were losing wickets at regular intervals as Stephen Bunting (15) followed soon after and then McClurkin was stumped by Adam Dennison for 38 to give Kidd his third wicket of the afternoon. Spinner Kidd has been playing with a dislocated finger on his right hand for almost a month now, so credit must be given to him for performing at such a high level and he has now moved to 34 wickets for the 2018 season. White then joined Shane Getkate at the crease, and the pair steadied the ship, reaching their 50 partnership from 74 balls in the 32nd over. The spin of Kyle McCallan, Lee Nelson and Kidd meant the run-rate had slowed right down, but the return of pace allowed for more attacking shots, with Getkate smashing a six into the field and White striking a couple of lovely boundaries. They looked so comfortable in the middle, but disaster would strike in the 34th over when a mix-up between the duo resulted in Getkate being ran out for 26. Oliver Metcalfe followed soon after with a fantastic diving catch from wicketkeeper Dennison after he sprinted to make up the ground to leave Instonians on 177-6. Dennison has rightly earned the plaudits for his fantastic season with the bat, but his terrific performance behind the stumps in the absence of regular keeper Marcus McClean shows he has an added layer of importance. 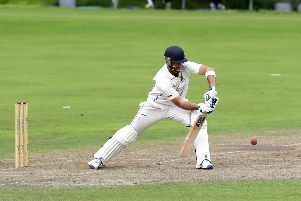 White remains one of the very best players in the NCU, and moved to his sixth half-century of the season with a four over mid-off, but was quickly running out of partners. He ended on 58 when he chipped Eaglestone to Thompson at point, and he will have been disappointed that no one was able to stick around to help him out at the end. The run out of Getkate changed the game, with Instonians losing their last five wickets for only 35 runs after such a positive start. Rain arrived during the interval, and when play eventually resumed, it was halted again with Waringstown on 12-0 and the target was reduced to 173 from 35 overs. Opening pair Dennison and Hall have both passed the 1000-run mark for the season and they continued in that fashion as they raced to yet another 50 partnership in the 10th over. James Hunter was introduced into the attack and made a vital breakthrough when he bowled Hall for 39, and Dennison followed soon after for 27 when he struck Magee to deep square leg, where Oliver Metcalfe took a good catch. Nelson has proven to be Mr Consistent for the Villagers in 2018, chipping in with crucial runs and taking over 30 wickets, and he had another role to play with the bat to see his side home. Waringstown were cruising towards the total but lost a few wickets in a cluster when Shaheen Khan, Thompson and Ryan Dennison all departed, but it was too little too late for the Belfast side to make any impact on the game. Nelson ended on 28* to seal the four-wicket win with an over to spare and push eight points ahead of their third-placed visitors. Instonians will regret not making more of their bright start which was set by Metcalfe and McClurkin, but Waringstown bowled well to pull the game back. With CIYMS also winning, it means the title is still theirs to lose, and Waringstown will have to hope they slip up somewhere while also winning all of their remaining games.